I love tulips. I grabbed these at a farmers market. They have the bulbs attached to them. The vendor told me that they will last twice as long if I didn't cut them off. Done! I found the zinc pitcher at our flea market this past weekend. Another item that I purchased in the pitch dark. I know and trust this seller. I asked him if I would love it in the light. Knowing my taste he assured me that I would. Of course I came back and fell in love with it, dents and all. I don't collect many things. That is one of the limitations of living in an apartment the size of a postage stamp. There are two things that I manage to fit in though, enamelware (pitchers and lunch boxes) and hotel silver. I love love love the latter. About 20 years ago I fell in love with it and cheated because I didn't know anything about it. I simply liked the look of it. I bought a set at Pottery Barn. And I still love that set. Since then I have begun to collect a piece here and a few there. In our home we don't own a set of stainless. My feeling toward it is, if you love something why put it away and use it only on special occasions? I don't understand that philosophy. I do have to polish it once in a while but very rarely. I consider that a small price to pay. Most old San Francisco apartments don't have dishwashers, unless they have been updated. And even if you wanted to put one in, there is not the space to do so. Therefore I hand wash everything. These Fairmont pieces are a recent find at a lovely shop in San Mateo called The Pickled Hutch. Lisa has beautiful items. I am a fan of things not matching as a rule. So the fact that one person at a table has pieces from the Fairmont and the neighboring person has a set from the Peralta, adds interest and a bit of charm, in my opinion. 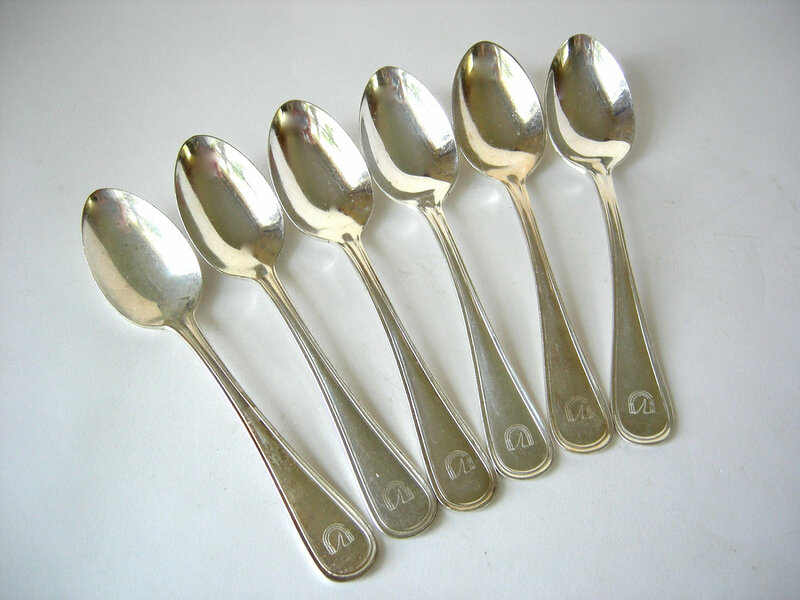 I bought the spoons below from a seller on Etsy called Tipple and Snack. Those are sailboats. I found this piece at a french flea market in Sonoma last year. She had a few. Wish I'd bought more than one. I love how beat up it is. (I like it in spite of the fact that the initials stand for the arch rival school to my college). "The visual appeal of hotel silver is undeniable, but the vintage wares are also intrinsically practical. "Silver that is used frequently doesn't need to be polished," she points out. Plus, she continues, "The more you use it, the better it looks."" Oh! I love hotel silver too. It has such a richness and solidity to it. Do you remember Shen they revealed those titanic pieces s few years dgo? I didn't like the disruption to the are but the silver was luscious. I love your hotel silver. I found one piece...a teapot...that I love. Your hotel silver is beautiful! I like how you have a mix of patterns and I agree it has a special look to it that is different from everyday silver that most of us use. Your tulips look so bright and perfect, I can't believe they are real! They're amazing. Love that zinc pitcher too. I've become very fond of that finish. Your table is art. Beautiful. How perfect for the weekend's meals, and conversations with the girls. I enjoyed viewing your collection of hotel silver. It's lovely! I have a few pieces that belonged to my grandmother. Your hotel silver makes for a great collection without taking up too much space! I'm so glad to see you using it regularly. As for the tulips, they are beautiful! My husband grows that same variety in our garden. I love tulip season! Beautiful flowers and the pitcher is fantastic!! I love Hotel Silver too, I have a few pieces in my collection. 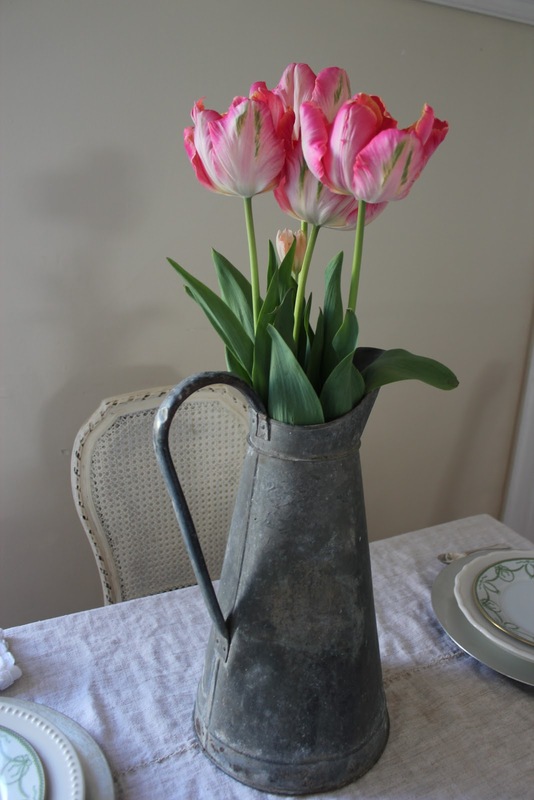 I love your new vintage zinc French body pitcher, Michele! It's just perfect - dents and all. It looks alot like the one I have! I also wanted to thank you for your sweet comments about my Mom. I deeply appreciate your prayers and thank you for each and every one. Bless you, sweetie. I love all your pieces - wonderful collection you've got going. What a great collection. I am going to have to pay attention to silverware more when we are on our travels. I had to smile when you were talking about no dishwasher! We live in an old farmhouse with no dishwasher and it would take a total kitchen reno to be able to put one in (and that isn't going to happen any time soon!) The kids think we are the only family without a dishwasher...I am going to share with them that we aren't alone! Hi Michele! I love vintage silverware, and you have some really lovely pieces!!! Beautiful tulips too!! You are so right in mixing all the different pieces. It keeps it a little less formal and more inviting. I gave my stainless away years ago and got my mom to do it as well. 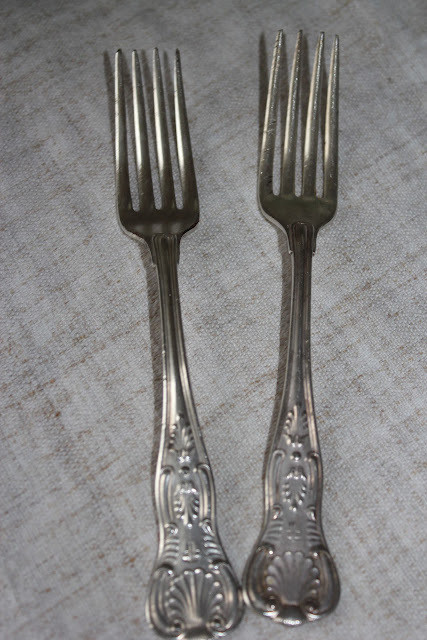 I was shocked she agreed because she came from a generation where the good silver only came out on special occasions. And of course, I love your linens! Thanks for stopping by! We certainly share a passion for the same things. Love your blog! I haven't picked up any hotel silver as of yet, but I would if I found some. I do have my Mother's sterling, but confess I only use for company ( but I do like to have people over a lot!! ).